The detection kits vary based on the detection objective. 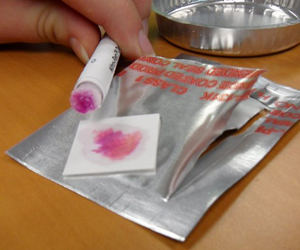 The detectors can be small, individually packaged anecdotal tests for screening small areas or detection kits for rapidly conducting a large number of tests. ChemSee will also be happy to design Kits to meet specific customer needs. If you believe an alternative Kit design will better meet your needs, please let us know when submitting your quote. Used to spray a large suspect area with a solution that changes color when an exploive is detected. Detection Kit includes contains all the materials to conduct the tests needed. The kit is avaliable in 3 sizes: 25 Tests, 50 Tests and 100 Tests. Materials included are Solution A, Solution B, Solution C, Collection Pads, Quality Assurance Tabs and a rinse bottle. Used to spray a large suspect area with a solution that changes color when an exploive or explosive precursor is detected. Detection Kit includes contains all the materials to up to 100 tests each. Materials included are Solution A, Solution B, Solution C, Solution U, Solution P, Solution 1, Solution 2, Collection Pads, Quality Assurance Tabs and a rinse bottle. Portable kit which contains indiviually wrapped detectors including: 5x of the Nitro-Pen (including Z-Pad & Val-Pad accessories), On-The-Spot, Verifier, Gel-Ox, Chlorate and Perchlorate Detectors and Collection Swabs. Portable kit which contains indiviually wrapped detectors including: 5x of the Nitro-Pen (including Z-Pad & Val-Pad accessories), On-The-Spot and Collection Swabs. Portable kit which contains indiviually wrapped detectors including: 5x of the Verifier, Gel-Ox and Chlorate and Perchlorate Detectors. Portable kit which contains indiviually wrapped detectors including: 5x of the Nitro-Pen, On-The-Spot, Verifier, Gel-Ox, Chlorate and Perchlorate Detectors and Collection Swabs. Packaged in a small, easily storable Kit. Detection Kit for rapidly screening a large number of samples or people. The kit contains materials for testing 140 samples for the presence of ALL Nitrate-based Explosives. Detection Kit for rapidly screening a large number of samples or people. The detection kit contains materials for testing 140 samples for the presence of ALL Nitrate-based Explosives. This detection kit also includes 5x of the Verifier, Gel-Ox, Chlorate and Perchlorate Detectors. Chemsee has the capability of creating a custom kit just for your needs! If you are only concerned with a specific explosive, or several types of explosives and don’t see a kit that fits your needs, please request a quote.